Sandy Papavero works with excited entrepreneurs who have a passion for their business but might not have the experience to manage the financial part of their business. Unfortunately most entrepreneurs I meet aren’t even aware that they are driving themselves into debt, or at least leaving themselves open for massive financial stresses in the future, simply because they didn’t understand the business of their business. Hugh Ballou: Hey there. 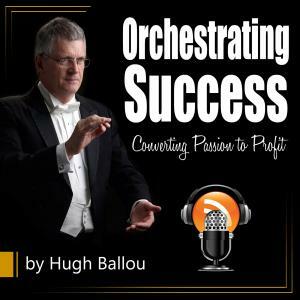 This session of “Orchestrating Success: Converting Your Passion to Profit” is an interview with my longtime friend, Kelli Holmes, a longtime friend who I haven’t seen in a number of years. We just connected on email and said, “Let’s tell people what we need to know about getting outside of our office to connect with those people who are so important to our business but we don’t know.” We call it networking. Kelli, welcome to my podcast. Kelli Holmes: Thanks, Hugh. Wow. Fantastic to be here. Great to see you. Don’t we love technology? We can see each other with being thousands of miles apart. It’s great. Hugh: I’m in Virginia, and you’re where in California? Kelli: Just outside of LA in a sleepy town called La Verne. Hugh: Oh yeah. We in the South think California is another country. Kelli: Sometimes in California we think California is another country. Hugh: Kelli, tell us your company name. It’s a really cool name. Hugh: I love it. What does this company do? Kelli: We primarily help small business owners, entrepreneurs, and independent contractors—those in some way, shape, or form responsible for generating their own success—by teaching them how to network effectively and build valuable business relationships that can build and grow their business. It’s really through the power of relationships and referrals. We are known for networking groups and events. Our marketing path is through the word of mouth and networking opportunities. Hugh: Awesome. There is a crossover here. I teach that leadership is basically building relationships. I talk about the pathway to revenue is built on relationships. Hugh: Communication is based on relationships. There is a hand and glove with my methodology and what you actually do in real life. How did Kelli get interested in building this networking business? You have been doing this 19 years? Kelli: No, 15 years. We just celebrated our 15th anniversary last week at our signature event. It’s an annual event, but last week’s event we turned into a 15th anniversary celebration. I have a very typical entrepreneurial story. 15 years ago, knowing that I loved this type of business and working with entrepreneurs and there is a lot of networking groups and choices out there, how do we build a better mousetrap so to speak? We decided to start TEAM Referral Network based not only on the premise of better networking and relationship building and referrals to grow your business, but also how to insert better technology. 15 years ago, there was a different picture in terms of the technology landscape, and we were able to be pretty cutting edge with what we brought to the table and to put heart into it by working with nonprofits. We have opened hundreds and hundreds of chapters of TEAM Referral Network, and our goal is to plug in a nonprofit to each of those chapters, donate the membership to them, teach them to network, and connect them with a great group of businesspeople in our community to further their organization. It was adding the community outreach plus technology on a traditional theme of networking events and groups that started TEAM Referral Network. Hugh: I love it. What is your secret power that brings energy to networking? Kelli: My personal philosophy is a lot of people confuse networking with relationship marketing. Networking is usually the act of getting yourself out there, connecting with people, creating that initial opportunity. The real secret power comes after you’re networking, and that is how you follow up. That is how you make a connection, build a connection, continue that conversation, and then build a relationship that then helps you achieve the success you are looking for. Rarely does it happen that you go to a networking event or put yourself out there in a networking environment and you walk away that night, that day, that afternoon with business in hand. Sometimes people are confused as to what their networking results should yield. I believe the real results come from the relationship afterward. That is my secret power of effective networking. Hugh: I like it. You and I hit it off when we first met. We did meet at a business growth conference called CEO Space, which is a different kind of networking event than what you do. You and I had several conversations. I believe you taught there. I have taught there 54 times in a row. Let’s talk about the leadership components of networking here. I have heard you say it’s not a natural act. What does that mean? Kelli: A lot of people think because I am so comfortable at being out there networking- You have probably observed me in a room full of people, I am pretty comfortable with the process of meeting people, connecting with them, making them feel at ease in having a conversation with me. A lot of people think I was born that way. That is just the natural way I conduct myself. The opposite is actually true. I am actually quite shy and very personal. I am not really a natural born networker. Most people aren’t. It really is a skill if you want to become effective at it and want it to help you yield results in your life and help you in your success. Networking is something that has to be practiced. You have to understand what the skillset is and where you have room for improvement and then how you go about improving your networking skills. Sometimes it is a matter of jumping in and doing it. Other times it is getting finer points of networking from experts in the field as well. But it’s not a natural born trait for most of the population. Hugh: I agree. People have noted that I know how to work a room and that it comes naturally to me. I really care about people, and I connect people. It’s part of my DNA. Having served in church music ministry for 40 years, it’s all about building relationships with people so people want to show up at church on Sunday. Work on your baton of abuse, “Do this, do this,” but it’s fulfilling. My church in Atlanta had 12,000 members. Networking was a fundamental part of my job. You mentioned in the explanation that you were actually a shy person. Garrison Keillor defines shy people as people who are radically polite. There is a difference, I understand, in being shy and being an introvert. Shy is being on the sidelines, but an introvert is how you gain your energy, regenerate your energy. When I am in a room of people—by the way, I am an extrovert, duh—that generates lots of energy, so after a two-hour rehearsal at night, I have adrenaline for hours. I am pumped up. Others who are introverts, that really drains them. After that, they crash. Is it an advantage or a disadvantage to be an introvert and try to network? Kelli: Interesting. I am definitely an extrovert. I should clarify that. I am more shy in terms of really when I was growing up, I did not enjoy putting it out there and being the center of attention or anything like that. I left that for other people. But I later developed the skills to be able to feel very comfortable on stage. I speak in front of hundreds and hundreds of people. It’s not a problem for me any longer. The very interesting element of what you bring up here is one of my business partners, who is a franchise owner for TEAM Referral Network in multiple markets, Stacey O’Byrne, best-selling author. You may have met her also at CEO Space. Stacey and I speak a lot in tandem together at events. She is an absolute introvert, and I am an extrovert. We approach the room very differently. As an introvert, Stacey is very effective. She will arrive early. She will put herself in a position at a networking event where people come to her. As an extrovert, I am always arriving a few minutes late. I like the stage set before I come in. if it’s possible, some kind of entrance is great. I’ll come in and do what she refers to as the flutter-by. I will flutter by all the people in the room, making connections, learning who they are, connecting them, getting information about them while she very much stays stationary and has people flock to her. As an introvert, that is how she effectively networks. You and I being the extroverts like to work the room, and she as the introvert likes to plant herself and have people come to her. By her personality and the information she is sharing with people and the connections she makes, she actually has a very commanding audience that come to her at networking events. It is a fascinating thing to watch happen. Hugh: Our preconceived ideas of being an introvert or extrovert aren’t necessarily true. Hugh: That’s fascinating. Sometimes, people judge us unfairly when we are really gifted at getting out there and being connected. We think they are overfunctioning from their ego. We’re not really doing that. Speak to that. They are certainly not connecting because of their own lack of skill, and they think of us as egotistical. We can’t prevent it. How do we deal with that feeling? Sometimes I talk to people and they say, “I don’t want to get out there because it seems like I’m egotistical talking about my stuff.” That’s a wrong idea, a wrong concept of networking. Kelli: That’s interesting. I actually do take the approach when I’m networking that I make it about the other person. If you were to engage in a conversation with me at a networking event, whether it’s something as simple as a chamber function that has 100 business owners, or it’s a large-scale business expo or trade show that may have thousands of people there, if you were to encounter me—my personal philosophy when we meet- And Hugh, you may remember this about a conversation we had initially had. My focus will always be on the other person. I’ll introduce myself, “Hi, I’m Kelli Holmes, and I’m with TEAM Referral Network.” I very rarely ever give my title as CEO of the company. “Who are you?” I proceed to say, “What do you do? Why are you here? Who are you looking to meet? What city are you located in?” I will start spinning the internal database in my brain of who could I connect this person with? How can I help them with their business? When I disengage, I always try to make the opportunity for us to follow up: “I have somebody to introduce you to; I’d love the opportunity to continue this conversation? Would it be okay if I” then fill in with email, call, text, whatever your preferred choice of communication. They love that because you made it about them, and that is how they remember you. It’s how you make people feel that leaves the lasting impression. When you do talk about yourself, you don’t always leave the other person feeling like they were special. I guess the shy, extremely polite person inside of me wants to make them feel special in my networking attempts. That is how I have always conducted myself. Going back to that question of my secret. I always get them to take my calls, emails, and texts afterwards, which is the goal of continuing the conversation and building the relationship. Hugh: Yes. What I have experienced in some networking groups is just the opposite. People come in, want to tell you all about them, and never ask you about you. What you just demonstrated is so brilliant. You continue to ask about them, and then when it’s your turn- Probably it prompts them to want to ask about you; do you find that to be true? Kelli: If they are polite people, they almost invariably want to ask about you. Oftentimes I will redirect it back to them. I will share a tidbit about me, something that I think would be valuable for them to know about me, and then I will shift it back to them again. It will eventually get around to knowing each other if the relationship opportunity continues. Quite honestly, if it doesn’t continue at that point, there is not a lot of value to that connection. People don’t go out of their way to help another person be successful when they barely know them or met them for a few minutes at the networking event. That is the big myth out there. If you ask an entire room full of businesspeople who go out and network and say, “How many of you are getting all the results you want from your networking activities?” there will very rarely be a single person in the room who will raise their hand. They are expecting results from networking, and results come from relationships. Hugh: Say that last line again. Kelli: Oh good lord. Results do not come from networking. Results come from relationships. Hugh: That is so spot-on. When I spoke about building a choir, when I first went to this church in Atlanta, they greeted me by saying, “We just lost 200 choir members.” I built back the group because I built relationships with people. Fundamentally, we make money in business because we solve a problem. People won’t buy from us until they trust us and they feel like we care about them. There is a relationship piece there. We have mental capital. We have really good stuff. We want to push it on people. We want to make money off of it. In between the intellectual capital and the financial capital is relationship capital. Leadership, that is my area. If you need surgery, ask the surgeon, and they will say yes. Ask me if we need leadership, and it’s yes. What you are describing are very developed leadership skills. We don’t think of leadership correctly; we think of it as being the boss and telling people what to do. In reality, leaders are people who make things happen. We influence others. You have greatly influenced so many people. How many chapters do you have around the world? Kelli: We have opened over 400. I love the way you said around the world because we are now in the Australian market and soon to be in the Singapore market. Thank you for that. Hugh: TEAM Referral Network International. Hugh: People are people everywhere you go. Part of your 15-year journey is figuring out the mechanics of it, but a large part of it, I’m willing to bet, is you building relationships with people who know that you care about them, and there is a win-win in the collaboration. It’s a network, but really it’s a collaborative thinking piece that you are promoting, isn’t it? Kelli: It is. Education in and of itself is a big part of our program. We insert it into every single weekly meeting and other networking events that we put on. It’s our big goal to help that entrepreneur get out of their own way and be able to build those relationships to be successful. It takes a lot. I have a great time. I have a lot of franchise owners who are franchisees for TEAM Referral Network. We became a franchise in 2012 and started opening up new markets outside of the corporate-owned area. Those people I rely on very heavily. I have a great staff and a great group of directors who help build, grow, promote, nourish, and nurture TEAM Referral Network as well. We talk about leadership, really empowering those people that surround you is the job of a leader. My job is to empower them to do the work they want to do and that it’s philosophically aligned with the work we want them to do. When you are surrounded by great people, you feel that and see that in the decisions they make and the leaders they become. Hugh: That is so good. We develop leaders on teams. What you gave is my short definition of transformational leadership. It’s building high-performing culture. What are the things that leaders need to learn the most? A Dun and Bradstreet study done in 1995—the statistics haven’t gotten any better—showed that 90% of entrepreneurs fail because they don’t have the ability to run this business. They call it manage, but I think it’s leadership, it’s the ability to run it. One of them is we get so buried. You just describe the art of delegation. You find good people, you give them worthy work, you define what the outcome looks like, and you get out of their way. That is what I heard embedded in your words. Did I get it? Hugh: Those are all good leadership traits. Leaders are bound because we are doing too much. I created a new sequential program for entrepreneurs called Unbound Leader. We get bound up by our own shortcomings and our own lack of vision. I have created a sequential program for people who know how to do everything they should know when they really don’t have the skills to run a business. Besides that, we get sucked underwater here when we get overcommitted and overfunction for our team. We don’t really get to network. When we do, we are frantic because we have to have business. There is this anxiety that comes across that creates negative influence on people. It really repels what we are trying to attract. Let’s go to the prescriptive mode. What are some things that leaders do wrong, and what is the flip side, what should people do to correct it? What are the top things that leaders do wrong when they think of networking or they actually try to do networking, and what are the ways to fix them? Kelli: One of the very common themes that I see out there with people is they don’t do enough research on the events they are actually participating in. They oftentimes hear of a networking event that triggered in their brain some places, “I should go to that.” My question back to them would be, “Why? Is it the right audience? Is it the people you want to network with? Is it going to be meaningful to your business?” Oftentimes we are taking the shotgun approach of if we create enough activity, we will somehow magically make results out of it. I have found that most people spend more time researching and thinking about what they are going to do for dinner than they do for their plan in terms of networking. It’s true, right? It’s true. I will give you a great example. A year or so ago, I was in Utah at a networking event. I was invited to speak at it. It was a room full of 75-80 people and part of the meeting was meet and greet beforehand. Everybody was standing around and meeting each other and talking. I was with a gentleman who introduced himself as the owner of a biomedical company that tested bodily fluids for a variety of things from drugs to allergies to pregnancy to all of the things in between. I said, “Oh, what are you doing here?” He said, “I came to hear you speak about networking.” I said, “That’s great. Are you thinking you’re going to meet somebody here?” He said, “Yeah, I’m looking to meet some people.” I said, “Who are you looking to meet?” Very specifically, he went on to share that he was looking to meet doctors who own medical groups. You belong to a medical group for your own medical needs. At some point, those doctors that are all part of this one medical group is owned either by a group of doctors or sometimes one person. He was looking to network specifically with those people. I said, “Do you think you’re going to find them here at this general small-business networking event that I’m speaking at?” He said, “No, I guess I won’t be meeting them here.” I said, “No, this isn’t the best networking choice for you. I’m really glad you came here today. Clearly we were meant to meet, and clearly I have the opportunity, if you’re open, to coach you and let you know that you should be looking at the American Medical Association’s networking events. You should be looking at charitable golf tournaments that focus in the medical community.” So I gave him a litany of where to go and research networking events. But he hadn’t given a single thought to the fact that he was not going to be networking directly with a potential client or even with people who potentially serve his potential client. Technically, he was in the wrong networking event. That is what I mean by people do not plan out and strategically think about where they need to network and who to connect with, let alone the actual act of it and the follow-up that comes afterwards. Hugh: That’s about events. What are other ways to network? Kelli: There are many networking choices out there. One of our biggest things we do with TEAM Referral Network is we do weekly networking groups. Joining some kind of group. There is everything from non-category exclusive groups where you could go and there could potentially be ten real estate agents in the room and 20 insurance people and five dentists. There is exclusive category networking, which is what TEAM Referral Network does. In each of our chapters, we have only one person per business category. There is regional events, there is educational workshops, there is conferences. Networking can be done virtually anywhere. I am probably guilty of networking at my child’s softball games. I know I am guilty of it. You networked with your 12,000 people at church. I sit on the board of my kid’s high school, and I network with that group of people. Again, I might do it because it is my way of life, but other people can certainly incorporate it in virtually almost everything they do without being overbearing. It’s about building relationships, learning about each other, and having a natural inquisitive nature to find out who they are, what they do, and what they need in life. It may or may not be something that you can help them with, but you’d be surprised as a leader and as a natural resource to help connect people. They really appreciate it. Hugh: This is a big topic, and I’m thinking about not bringing it up. But I am going to bring it up anyway. Social media is a form of networking that I observe most people do poorly. But it reflects how they show up at networking events. “Hi, I’m Joe. I’m a financial planner. How about we meet and I can analyze your finances?” I don’t want you to analyze my finances. I just met you. That was an example out of my hat. But probably the way people do networking in person is how they do it on social media. Is that somewhat true? Kelli: I would think that is probably pretty true. Although I will say flat out that most people don’t know how to do social media in a way that is going to build and grow their business. It depends on what you are looking for out of your social media. If you are looking for true business growth out of social media, you really need to work with somebody who knows what they’re doing to get you on the right track. If you are looking to make a connection and build relationships, then you can be a little more casual on how you do your social media, again, in my opinion. If you were to go to my Facebook page and see what’s on there now, it would be a combination on any given week of business, my life, my children, an event that has happened, and something as simple as an observation. If somebody is a friend of mine on Facebook specifically, they will get a glimpse into Kelli Holmes’ personal life, as well as her professional life. That might attract or—based on the fact if they are not an Oakland Raiders fan—repel certain people and might help us either build a relationship, certainly not start one, or even end one perhaps, depending on who you are. It can help it in that way. Social media can help build relationships. But if you are there to strictly build your business, you want the correct LinkedIn page, the correct business page on Facebook, and the ads. There are many different social media outlets. We just had a great social media expert at our 15th anniversary celebration last week. They were phenomenal at laying out the business approach to social media. There is a lot that can be done that way, and it can be very effective networking. But I don’t think relationships are built online although there are many marriages that have been built online. I don’t necessarily think business relationships- I think it often does take, even if it is this kind of human interaction we are doing right now with seeing each other on Zoom, I think that people like to know who they are doing business with. Hugh: Absolutely. I have made lots of significant connections on Twitter. That is my main network. Hugh: 200,000 of my 250 are on Twitter. Hugh: I do pay attention, and I don’t push out buy this and buy that. Is social media part of the expertise of TEAM Referral Network? Kelli: We have a chapter technician in each chapter of TEAM Referral Network. We have each of our chapters engaged- We have a great strategic relationship with MeetUp, which is a great social media platform for networking. We do incorporate that into each of our chapters and into our philosophy of helping them build and grow their chapters and their businesses. Also, each member gets their own webpage at TEAMreferralnetwork.com, and we have a social media link that helps them with their search engine optimization. I know I actually sound like what I know I’m talking about right now, and I don’t. I just know it all magically somehow happens with the great people that we work with. Hugh: Leadership is about defining your gaps and finding good people to fill them. Hugh: We don’t have to know everything, Kelli, to be successful. You have given lots of tidbits here that are helpful for any leader running any kind of enterprise. I am sitting in a big gap. There is no TEAM Referral Network within driving distance from me, even a day. Hugh: I can’t play in your party, can I? Kelli: Actually, you can. We have virtual TEAMs as well. Maybe it’s time to plug you into an online chapter. Or as a community member. You are a member of the tribe without the responsibility or the opportunity of being part of one of the weekly chapter meetings. That is only until we come to your market space there, Hugh. Give me a month or two and I will whip up somebody there. Hugh: You will hunt me down. So there is people listening there who want to find out more. They go to teamreferralnetwork.com. Kelli: Yes, it is a very friendly website. It is a two-sided website. For the general public, it is a marketing and branding site that is chock-full of great information. We have a great 30-day free trial membership that they can sign up for. We have a free networking guide I wrote a while back called “Effective Networking: Is Your Networking Not Working?” that they can download for free. A couple freebies for them to check out and see what we’re all about. We are able to search where we do have team chapters and what markets we are in currently or if you are interested in bringing a chapter to your area. Hugh: That is awesome. I am going to give you the final last hurrah here. As we are ramping down and summarizing, I’d like you to leave people with a thought or tip or primary strategy that people should be thinking about. Before we do that, is there anything we didn’t cover? I am sure there is a lot we didn’t cover, but something significant that you’d like to talk about before we end this that would give people some particular ideas on how they can improve their networking? Kelli: Yes. I will tell you one of the things that is a mistake that a lot of people make. I see it consistently throughout any networking event I attend. When people are communicating about who they are and what they do, they are very often networking to get that person’s business. Just like you gave the example of the financial advisor saying, “Hey, I want to meet you and review all your finances.” What you really want to do to be effective at networking and relationship marketing is to think about who that person knows. If you build a relationship and they hold you in such high regard that the opportunity comes for them to refer you to the important people in their lives—their family, friends, business associates, clients—that is a far more meaningful way to build a business than to worry about getting their direct business tonight when I am at this networking event with you. People look to get business from networking, and I say you look to go in and get relationships from your networking. Your relationships have a far greater reach. On average, we have measures of influence over 250 people, real influence, decision-making influence. Some of us, even more. Hugh, with your reach, it’s thousands and thousands of people. If I develop a relationship with somebody as influential as you, a leader like you, and you know, like, and trust me, when someone from your important circle of people needs my products or services, who are you going to think of? That is far more valuable than whether I have your personal business or not. I want people to realize the greater relationship net they are throwing out there is going to yield them greater results in terms of results and business growth. Hugh: That is so spot-on. I do find that cultivating relationships over time, I have had people who I have met at conferences come back to me years later and remember me. Now they are ready for me. Hugh: I didn’t press myself. I didn’t hammer them real hard to close the sale. I did some things right, Kelli. Kelli: Great to know, isn’t it? Hugh: Yes, ma’am. You have given us some really useful information today. As we depart, shut down this interview and bring it to a close, Kelli, what is a tip or parting thought you’d like to leave people with? Kelli: I want to teach them the power of two. It’s something I do a lot of workshops on as I travel around the country speaking on networking. When you are out networking and you have already set the strategy, researched the event, know where you’re going, and know what your goals are in mind, keep the power of two in mind. You want to meet two of the types of people you are looking for. Generally, there are people who can help you and be collaborative and be a partner with you in your business and you with theirs. But two is not an overwhelming number. We oftentimes become so overwhelmed with networking choices and the number of people at an event and how I work the room. If I am an introvert or if I’m shy and don’t know if I can work a room, if I share with you that you are going to walk out of there with two very powerful connections in what you’re looking to do, then you will ask for help and meet somebody and say who you are looking to meet, and oftentimes they will introduce you to that person. Think about the power of two. It makes it much more bite-sized and palpable to do. It is a very successful way if you follow the formula of follow-up and building relationship and continuing the conversation to get the results you are looking for. There you have it. Hugh: Kelli Holmes, teamreferralnetwork.com. Thank you for being here today and sharing these great thoughts for our listeners. Kelli: Thank you, Hugh. Mwah. Always wonderful to be here with you.